This post brought to you by Wendy’s. The content and opinions expressed below are that of Mom’s Messy Miracles. We live in a large development of townhouses, so we see quite a few kids for trick or treating. While we will still have the regular candy options for trick or treaters, this year I’m adding in something else! 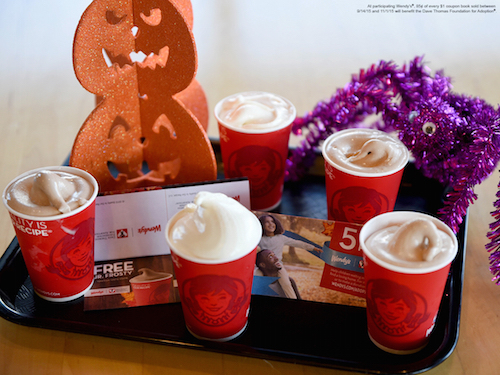 From September 14 through November 1, Wendy’s® is selling its Halloween Coupon Books. 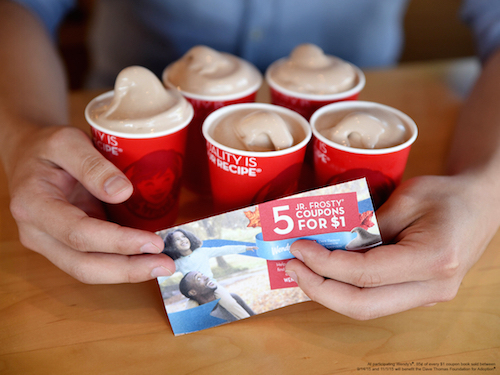 For $1, customers can get five or 10 free Jr. Frosty coupons. * Instead of handing out just candy this Halloween, consider purchasing a Wendy’s Halloween Coupon Book! Most kids right now are thinking about their costumes and dreaming of all that candy they’re going to be getting. The thing is though, they come home with so much candy! A free Jr. Frosty coupon can be used through January 2016, so it’s definitely a treat worth having. They’ll be able to use it long after the Halloween candy is gone. The great part about these coupon books is that funds from their sale will go to the Dave Thomas Foundation for Adoption® to support programs such as Wendy’s Wonderful Kids. ** Wendy’s® founder, Dave Thomas, knew first-hand the importance of having a family because he was adopted. He founded the Dave Thomas Foundation for Adoption in 1992. The foundation works to find permanent, loving homes for the more than 130,000 children waiting in North America’s foster care system. Dave Thomas believed that children in foster care “aren’t someone else’s responsibility, they are our responsibility.” Wendy’s continues to support that belief through fundraising and collaboration with the Dave Thomas Foundation for Adoption. Check out Wendy’s adoption page for more info. So, not only does your belly (and those you give your coupons to) appreciate the treat, you can feel good about it. If your store has the 5 coupons books, you’re only spending $.20 per Jr. Frosty! If your store has the 10 coupon book, that’s just $.10 on each Jr. Frosty! How awesome of a deal is that!?! I won’t be giving away all of our free Jr. Frosty coupons, of course! Mommy can always use a pick-me-up during the day, so a few stashed in the car sounds like an amazing plan! The coupon books actually have no Halloween design on them. They’re a simple fall design, meaning that you don’t just have to give them out for Halloween! Who doesn’t love a free Jr. Frosty? 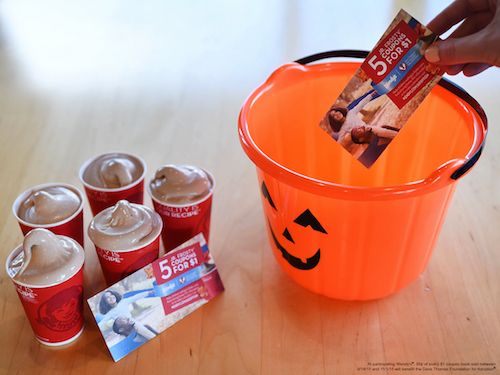 Want to give out Wendy’s Free Frosty coupons to your Trick or Treaters this year? You can pick up the coupon books now at Wendy’s for $1 each through November 1st! *Number of coupons per book vary based on location ** $0.85 cents of every dollar from the Halloween Coupon Books will go to support the Dave Thomas Foundation for Adoption. I got these last year when they had the same promotion. Hope this year I remember to use them all before January.